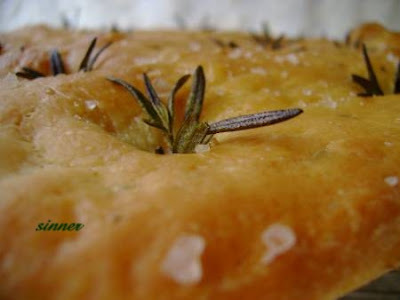 This focaccia is a very nice crusty bread with the lovely aroma of rosemary, delicious eaten warm or as a filled pocket for cold meat. In the space of a week, I have churned out three focaccias and have found that it freezes very well too. 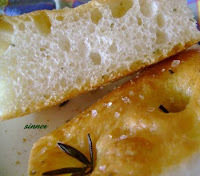 It is at the moment our favourite bread for lunch. As with any specialty bread, one has to be very patient and not try to rush the proving process. 2. Place water, oil, bread flour and yeast into the bread pan in the order according to your breadmaker instructions. Mix for 5 minutes or until the ingredients are combined. 3. Pause or switch off the breadmaker to rest the dough for 15 minutes. 4. Add the salt and continue with the 'dough' function. 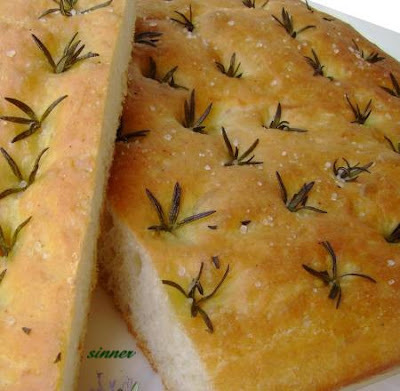 When the bread maker beeps for 'addition', add in the chopped rosemary. 5. Cover the breadpan with plastic wrap and refrigerate overnight. If not, leave in a warm place to rise until double in size (this will take about 1-2 hours). 6. 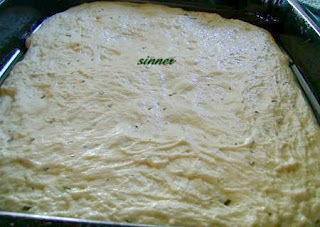 Tip your dough out onto an oiled baking pan. Press and pull dough lightly with your oiled fingertips to cover the base of the pan. (the dough will be sticky). I used my roasting pan which measures 36cm x 30cm. 7. Cover and let rise until double (this will take another 1-2 hours depending on room temperature). 8. Preheat oven to 220°C. Just before baking, use your oiled fingertip to form dimples about 1cm deep at regular intervals on the surface of the dough leaving visible indentations. Sprinkle with rosemary and sea salt. Drizzle olive oil over the dough. 9. Place the pan in the preheated oven. Spray the oven walls with a water sprayer to create steam. Do it 3 times during the first 10 minutes of baking (the steam makes the crust very crunchy and crispy). Bake for 15-20 minutes or until golden. 10. Remove and place on a rack to cool. Best eaten while still warm. 1. I find misting the oven to create steam with a sprayer bottle is easier and more effective than throwing ice cubes or leaving a bowl of water in the oven. The outside of the bread was crunchier using the spray bottle. 2. Leaving the dough to overnight and prove in the fridge is a real time saver and ensures you will have plenty of time to get the bread ready by lunch time. There have been talk that bread actually taste better with the overnight proving in the fridge. Update 5 June 2011 : I have been able to get hold of some fresh yeast. If using fresh yeast substitute surebake yeast with 16gm of fresh yeast. I have found that the dough rise much faster using fresh yeast. 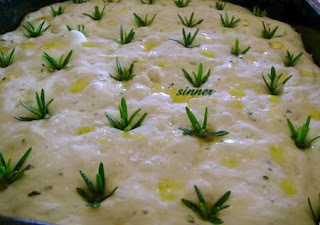 This is a short 1:45 minute video on the making of this Italian flat bread. Crank up the volume to enjoy the music of Duel by Bond. Updated on 13.11.07 with a video. 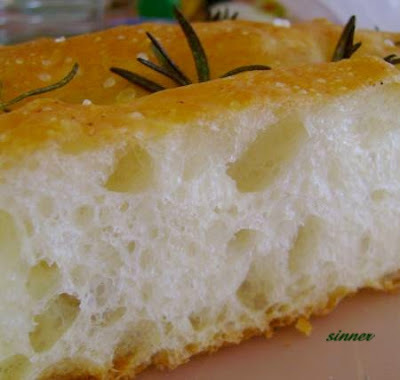 Helloe, it's me again :p. You bet I'll be hopping over real often, helping myself to the food, kekeke... and this is such a gorgeous foccacia! Thanks for your support pal :). I'm so glad to have found your blog, then I can come by to 'chi chi cha cha'. You hor, 'naughty' also leh, never told me you have a few blogs. 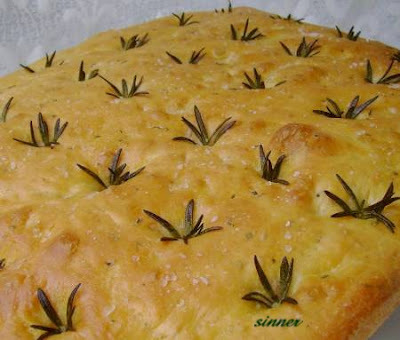 I finally made this delicious focaccia tho' is not as nice looking as yours, hee. My family and friends just love it! Thank you very much for sharing this wonderful recipe! Muak muak! :-). I got a question tho'. After the 1st proving, do we need to punch the dough down before tipping it out onto the oiled baking pan? No punching needed as the dough will be degassed after being tipped and 'manhandled' into shape. Thks for your reply, Sinner :-). Good morning, do you think we can plant rosemany in Malaysia or is the weather too hot. Silly is it asking this. Ha! Ha!, as I prefer those fresh Rosemary than dried ones. You should be able to grow rosemary in Msia. It likes hot weather and it thrives on neglect like the serai. See if you can get cuttings from somewhere or if you have to buy, buy a small plant and plant it outside. Small plant adapt more easily. The clay soil I have here is just like Msia. Make sure it is not waterlog. And don't pamper it. Thank you for your advice, I will try to look for the plant & plant in a bigger pot, will let you know if I have my own Rosemary. TQ. I am planning to tackle this recipe next week. Can you give me some tips on what is the best way to freeze and also defrost/reheat the bread? Will it keep outside for a day? To freeze, cut to required portion size. To defrost naturally take it out a few hours earlier. For us it is usually last minute, so we nuke ours in the microwave. Then to crispen the outside, we leave it on top of our toaster. It will be alright outside for a day but if eating the next day, better to freeze. Sorry I have another question! If I prepare the dough on Saturday night and let it proof in the fridge until Sunday night (I want it for dinner), is that too much time proofing or will it be ok? Your dough won't be over proofed. Infact slow and long proofing improves the flavour of the bread. If the bread is for Sunday night dinner, I would take the dough out from the fridge Sunday morning to give it plenty of time to get to room temperature. If the dough reaches the top of the pan, just keep gently punching it down until you are ready for the next step. Remember to give yourself plenty of time as dough sometimes have a mind of its own. Sinner you are amazing!!!!! I LOVE this recipe! I put all sorts of toppings on mine and it was gorgeous! 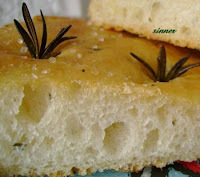 Best of all the cooked foccacia froze beautifully and makes a great lunch for hubby. Isn't it great, your hubby can have variety for lunch instead of same old same old. Thanks for posting the recipe and the video really helps. I tried it out last week and it turned out great. One question though: my focaccia stuck to the baking pan especially on the four sides and it took me a bit of time to get it out. Did this happen to you? Also, the bread is a bit dry near the edges. Is it supposed to be like that? A bit of the sides here and there do stick to the pan. After baking I usually loosen the sides which is stuck with a flat wok ladle. The sides are the best bits as it gets crusty and crunchy. any substitutions for the yeast and bread machine? i don't think we have that kind of yeast in my area(los angeles) and i only have kitchen aid. You can sub my yeast for any yeast you are currently using for bread. Same quantity. Kitchen Aid would be most suitable for this recipe. It is just that my breadmaker is very versatile and I use it as my slave dough kneader. But do follow steps 2-4 closely.